LBNL researchers have developed a suite of free, open-source software tools (WINDOW, THERM, OPTICS, and Radiance) that enable industry to evaluate the thermal and daylighting performance of window components and systems. The tools continue to be updated as new calculation methods and procedures are developed by the international research community and codes and standards organizations. Laboratory measurements of glazings, shading, and daylighting materials are compiled into publicly accessible databases (IGDB, CGDB). To facilitate informed design, LBNL has also developed several tools for the residential (RESFEN) and commercial (COMFEN) markets that enable architects and engineers to determine energy use for prototypical spaces or buildings. 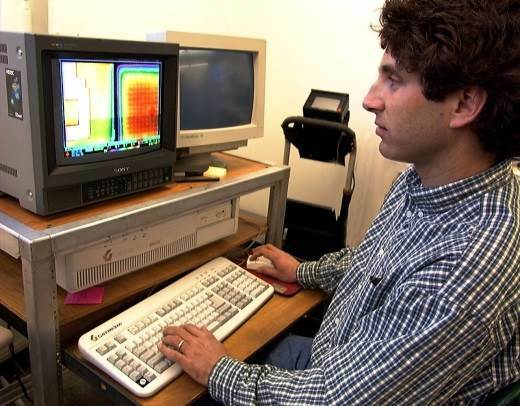 Dariush Arasteh (above), Charlie Curcija, and the LBNL software team have been developing energy analysis tools for evaluating fenestration systems over the past three decades. Schumann, Jennifer, Eleanor S Lee, Francis M Rubinstein, Stephen E Selkowitz, and Alastair Robinson. Tips for Daylighting with Windows: The Integrated Approach, 2nd Edition. 2013. Selkowitz, Stephen E, Robin Mitchell, Maurya McClintock, Daniel McQuillen, Andrew McNeil, and Mehry Yazdanian. "COMFEN 3.0: Evolution of an Early Design Tool for Commercial Façades and Fenestration Systems." Building Enclosure Sustainability Symposium (BESS), April 29-30, 2011. Pomona, CA, 2011. LBNL-5179E. Arasteh, Dariush K, Christian Kohler, and Brent T Griffith. Modeling Windows in Energy Plus with Simple Performance Indices. 2009. LBNL-2804E. Mitchell, Robin, Christian Kohler, Joseph H Klems, Michael D Rubin, Dariush K Arasteh, Charlie Huizenga, Tiefeng Yu, and Dragan C Curcija. WINDOW 6.2/THERM 6.2 Research Version User Manual. Berkeley: Lawrence Berkeley National Laboratory, 2008. LBNL-813E. Mitchell, Robin, Yu Joe Huang, Dariush K Arasteh, Charlie Huizenga, and Steve Glendenning. RESFEN5: Program Description. Lawrence Berkeley National Laboratory, 2005. LBNL-812E. Mitchell, Robin, Christian Kohler, Dariush K Arasteh, John Carmody, Charlie Huizenga, and Dragan C Curcija. THERM 5/WINDOW 5 NFRC Simulation Manual. 2003. LBNL-48255. Versluis, Richard, Rebecca Powles, and Michael D Rubin. Optics Version 5.1.01. Berkeley, CA: Regents of the University of California, 2002. LBNL-52148. Mitchell, Robin, Christian Kohler, Dariush K Arasteh, Charlie Huizenga, and Dragan C Curcija. WINDOW 5.0 User Manual for Analyzing Window Thermal Performance. 2001. LBNL-44789. Group, Windows and Daylig. THERM 5.0 User's Manual. 2001. LBNL-49233. Kohler, Christian, Dariush K Arasteh, and Robin Mitchell. "THERM Simulations of Window Indoor Surface Temperatures for Predicting Condensation." ASHRAE Transactions 109, Part 1 (2001) 593-599. LBNL-47962. Mitchell, Robin, Christian Kohler, Dariush K Arasteh, Elizabeth U Finlayson, Charlie Huizenga, Dragan C Curcija, and John Carmody. THERM 2.1 NFRC Simulation Manual. 2000. PUB-3147. Rubin, Michael D, and Rebecca Powles. "Optical Properties of Glazing Materials at Normal Incidence." Revista della Statzione Sperimentale del Vetro. Paris, France, 2000. 13-16. LBNL-48322. Huizenga, Charlie, Dariush K Arasteh, Elizabeth U Finlayson, Robin Mitchell, Brent T Griffith, and Dragan C Curcija. "THERM 2.0: A Building Component Model for Steady-State Two-Dimensional Heat Transfer." Building Simulation 99, International Building Performance Simulation Association (IBPSA). Kyoto, Japan, 1999. LBNL-43991. Mitchell, Robin, Yu Joe Huang, Dariush K Arasteh, Robert Sullivan, and Santosh Phillip. RESFEN 3.1: A PC Program for Calculating the Heating and Cooling Energy Use of Windows in Residential Buildings. Berkeley: Lawrence Berkeley National Laboratory, 1999. LBNL-40682 Rev. Huang, Yu Joe, Robin Mitchell, Dariush K Arasteh, and Stephen E Selkowitz. "Residential Fenestration Performance Analysis Using RESFEN 3.1." Thermal Performance of the Exterior Envelopes of Buildings VII. Clearwater Beach, FL, 1999. LBNL-42871. Sullivan, Robert, and Frederick C Winkelmann. Validation studies of the DOE-2 Building Energy Simulation Program. Final Report. 1998. LBNL-42241. Finlayson, Elizabeth U, Robin Mitchell, Dariush K Arasteh, Charlie Huizenga, and Dragan C Curcija. THERM 2.0: a PC Program for Analyzing Two-Dimensional Heat Transfer through Building products. 1998. LBL-37371R. Huizenga, Charlie, Dariush K Arasteh, Elizabeth U Finlayson, Robin Mitchell, and Brent T Griffith. "Teaching Students about Two-Dimensional Heat Transfer Effects in Buildings, Building Components, Equipment, and Appliances Using THERM 2.0." ASHRAE Transactions 105, Part 1 (1998). LBNL-42102. Arasteh, Dariush K, Elizabeth U Finlayson, Yu Joe Huang, Charlie Huizenga, Robin Mitchell, and Michael D Rubin. "State-of-the-Art Software for Window Energy-Efficiency Rating and Labeling." ACEEE 1998 Summer Study on Energy Efficiency in Buildings. Pacific Grove, CA, 1998. LBNL-42151. Griffith, Brent T, Daniel Turler, Howdy Goudey, and Dariush K Arasteh. "Experimental Techniques for Measuring Temperature and Velocity Fields to Improve the Use and Validation of Building Heat Transfer Models." Thermal Performance of the Exterior Envelopes of Buildings VII. Clearwater Beach, FL, 1998. LBNL-41772. Huang, Yu Joe, Robert Sullivan, Dariush K Arasteh, and Robin Mitchell. RESFEN 3.0: A PC Program for Calculating the Heating and Cooling Energy Use of Windows in Residential Buildings. Lawrence Berkeley National Laboratory, 1997. LBNL-40682. Papamichael, Konstantinos M, John LaPorta, and Hannah L Chauvet. "Building Design Advisor: Automated Integration of Multiple Simulation Tools." Automation in Construction 6.4 (1997) 341-352. LBNL-40591. Rubin, Michael D, Klaus von Rottkay, and Rebecca Powles. "Window Optics." Solar Energy 62 (1997) 149-161. LBNL-39911. O'Conner, Jennifer, Eleanor S Lee, Francis M Rubinstein, and Stephen E Selkowitz. Tips for Daylighting with Windows: The Integrated Approach. 1997. LBNL-39945. Griffith, Brent T, Elizabeth U Finlayson, Mehry Yazdanian, and Dariush K Arasteh. "The Significance of Bolts in the Thermal Performance of Curtain-Wall Frames for Glazed Façades." ASHRAE Transactions 104, Part 1 (1997). LBNL-40690. Griffith, Brent T, Dragan C Curcija, Daniel Turler, and Dariush K Arasteh. "Improving Computer Simulations of Heat Transfer for Projecting Fenestration products: Using Radiation View-Factor Models." ASHRAE Transactions 104, Part 1 (1997). LBNL-40706. Klems, Joseph H. "Greenhouse Window U-Factors Under Field Conditions." ASHRAE Transactions 104, Part 1 (1997). LBNL-40448. Papamichael, Konstantinos M, John LaPorta, Hannah L Chauvet, Deirdre Collins, Thomas Trzcinski, Jack A Thorpe, and Stephen E Selkowitz. "The Building Design Advisor." ACADIA 1996 Conference. Tucson, AZ, 1996. LBL-38584. Beck, Fredric A, Brent T Griffith, Daniel Turler, and Dariush K Arasteh. An Infrared Thermography-Based Window Surface Temperature Database for the Validation of Computer Heat Transfer Models. 1995. LBL-36957 Abs. Beck, Fredric A, Brent T Griffith, Daniel Turler, and Dariush K Arasteh. "Using Infrared Thermography for the Creation of a Window Surface Temperature Database to Validate Computer Heat Transfer Models." Windows Innovations Conference 95. Toronto, Canada, 1995. LBL-36975. Arasteh, Dariush K, Elizabeth U Finlayson, Michael D Rubin, and John Sadlier. "Recent Technical Improvements to the WINDOW Computer Program." Window Innovations 95. Toronto, Canada, 1995. LBNL-41680. Finlayson, Elizabeth U, Dariush K Arasteh, Michael D Rubin, John Sadlier, Robert Sullivan, Charlie Huizenga, Dragan C Curcija, and Mark Beall. "Advances in Thermal and Optical Simulations of Fenestration Systems: The Development of WINDOW 5." Thermal Performance of the Exterior Envelopes of Buildings VI Conference . Clearwater Beach, FL, 1995. LBL-37283. Arasteh, Dariush K, Elizabeth U Finlayson, and Charlie Huizenga. WINDOW 4.1: Program Description. 1994. LBL-35298. Reilly, M. Susan, Frederick C Winkelmann, Dariush K Arasteh, and William L Carroll. "Modeling Windows in DOE 2.1E." Thermal Performance of the Exterior Envelopes of Buildings V Conference. Clearwater Beach, FL, 1994. LBL-33192. Finlayson, Elizabeth U, Dariush K Arasteh, Charlie Huizenga, Michael D Rubin, and M. Susan Reilly. Window 4.0: Documentation of Calculation Procedures. 1993. LBL-33943. Beck, Fredric A, and Dariush K Arasteh. "A Validation of the WINDOW4/FRAME3 Linear Interpolation Methodology." ASHRAE Transactions 100, Part 1 (1993). LBL-34271. Arasteh, Dariush K, Fredric A Beck, Nehemiah Stone, William DuPont, R. Christophe Mathis, and Michael Koenig. "Phase I Results of the NFRC U-Value Procedure Validation Project." ASHRAE Transactions 100, Pt. 1 (1993). LBL-34270. Yazdanian, Mehry, and Joseph H Klems. "Measurement of the Exterior Convective Film Coefficient for Windows in Low-Rise Buildings." ASHRAE Transactions 100, Part 1 (1993). LBL-34717. © 2019 Energy Technologies Area. All rights reserved.